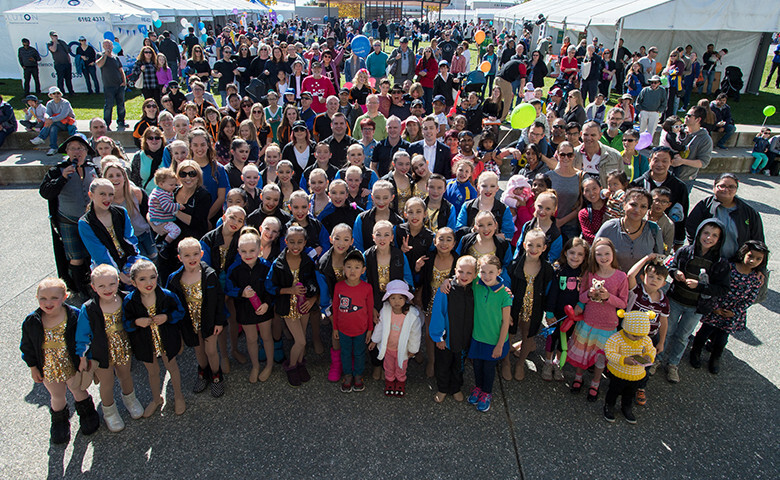 Communities@Work coordinated the third annual Celebrate Gungahlin Festival on Saturday 29 April with over 5,000 attendants. On 29 April, the Gungahlin Town Square was transformed into a hub of colour, energy, wafting food aromas, music, conversation and all-round great vibes at the Celebrate Gungahlin festival. It was the third annual year that Communities@Work coordinated the festival, and the third year that it has proved a successful and worthwhile event for the Gungahlin region, with over 5,000 people coming to enjoy the day’s festivities. Communities@Work CEO, Lorcan Murphy, addressed the audience at the beginning of the day to remind attendees of the relevance of community events, like Celebrate Gungahlin, to connect people and showcase all the incredible opportunities available at their doorsteps. He expressed that it is a priority of Communities@Work to help build stronger and more inclusive communities in the Canberra region, especially in Gungahlin, where it continues to be one of the fastest growing regions in Australia. There were several highlights from the day, including a performance and workshop from the talented team at Canberra School of Bollywood Dance. This saw over 20 children from the audience take to the stage to mirror the style’s iconic hand gestures, while bopping up and down to the contagious Bollywood beat. Other incredible entertainers on the day included GDANCE, Fresh Funk, Jazzy Jumpers, Dramatic Productions, Ginninderra Wind Orchestra, Ghawazee Moon Bellydance, Elana Wong School of Dance, Passion and Purpose Academy and performers at Cornerstone Church. One of the most popular areas on the day, second to the main stage, was Communities@Work’s Children’s Area, staffed by educators across Children’s Services. It was the place to be for children and families, with free face painting by two of our very skilled educators/fairies, sandpits, arts and crafts with real autumn leaves and playdough creations. Alongside Communities@Work, other organisations on the committee who worked leading up to and on the day to execute the festival included My Gungahlin, The Gungahlin Community Council and the Marketplace Gungahlin. A big thank you also goes to the sponsors of the Celebrate Gungahlin festival. These included Champion Supporters, Morgans Group and ACT Government; the Hero Supporter, Service One Alliance Bank, and other supporters, Luton, Icon Water, Yeend and Associates and the Canberrra Weekly. Without their generosity, the event would not have been the buzzing success that it was. You can access all event photos from the day at the My Gungahlin Facebook page.